Help the Torinaan clergy cleanse their holy sites. Torinaan — Help cleanse Torinaan of Daedric Corruption. Torinaan is a holy site dedicated to the Divines. It's been corrupted by Daedra. The loyal clergy there want my aid in cleansing the area. As you approach Torinaan, you will see Aldarch Colaste casting a spell on a magical orange barrier. Daedra attacked Torinaan, a holy site, and the penitents "writhe with foul magics." Aldarch Colaste is trying to contain the daedric threat. She suspects the shrines themselves fuel the evil. She asks you to cleanse the shrines. You can ask her how the daedric attack started, and while she is not sure, she does mention a visit from High Kinlady Estre. The four shrines are at the northwest, northeast, southeast, and southwest corners of Torinaan. At the southeast is the Shrine of Magnus and Syrabane. The shrine to Magnus is on the east, and the shrine to Syrabane is on the west side. Kill the enemies corrupting both the shrines, which will count as cleansing one of the four shrines. To the northeast is the Shrine of Mara and Stendarr. Stendarr is on the west side, and Mara is on the east side. In Stendarr's area, light all four braziers as quickly as you can before the first one is extinguished. 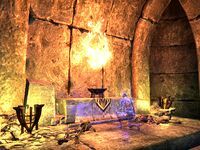 In Mara's area, light all the braziers as quickly as you can, the same as you did in Stendarr's area. To the northwest is the Shrine of Trinimac and Xarxes. In the eastern room, you will find the letter Bending to the Flame and a Rod of Divine Flame on the corpse of a Shrine Monastic. Stand behind the lit brazier, look towards the altar and use the fire rod on the flames. This restores the shrine to Trinimac. Next, you need to go to the western room to restore the shrine of Xarxes. Use the fire rod on the lit brazier to the right to light the middle brazier. Then, stand behind the middle brazier and use the fire rod to light the altar. To the southwest is the Shrine of Anu and Y'ffre. First, go to the eastern room. You will find a letter, The Font Aequiius, and a Chalice of Holy Waters on the corpse of a Shrine Monastic. Stand in the water and use the water chalice. This cleanses the shrine to Auri-El. Do the same thing in the western room to cleanse the shrine of Y'ffre. After you finish cleansing all four shrines, you will hear a voice tell you to cleanse the central shrine and end the Daedric corruption. Enter the shrine, and go to the right. You will see an enemy and a Daedric gate. Defeat the enemy, and the gate will disappear. Aldarch Colaste calls you over. She says the divines have more to tell to you. You follow her and see a vision of Estre praying to the Daedric prince Mehrunes Dagon. He gives her some of his power and tells her to corrupt the shrines in Torinaan, then move on to Firsthold. Talk to Aldarch Colaste again. She says you need to stop Estre and gives you a reward. 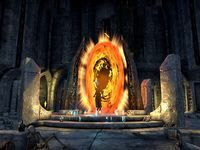 Although the Shrine to Anu and Y'ffre has two chambers, one for each of the gods, the shrine on the eastern side is a shrine to Auri-El, according to the Quest Objective. This could be a reference to Anui-El. This page was last modified on 14 August 2017, at 21:13.